My name is Stacy Berger. A lifelong student of the horse and an information junky for all things equine. 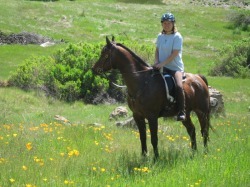 I reside in Powell Butte, Oregon with my husband Jim, our dogs Jojo & Phoebe and our 3 horses. With a background in business and project management, my passion is solving problems. Working with horses takes that passion out of the confines of big business and conference rooms into the barn. My time in the saddle has been on the trail (pleasure and endurance competitions); cattle sorting; the study of dressage; horse camping; and learning at various horsemanship clinics. The common thread required for successful athletic performance & soundness (both mental & physical) is to achieive balance. Saddle fit, horsemanship and healthy hooves are components that enable you and your horse to move freely and perform your work well. I look forward to working with you and your horse to help you achieve your goals.